As the summer quickly approaches after a great ski season this year, I find myself putting away the ski gear and breaking out the rock climbing gear. A visit from my great friend Jesse, who has spent the last four and a half years in Rwanda, gave me the perfect reason to take a few days “off” from work (alas, I’m never truly “off”), to get in some fantastic rock climbing near Denver. Jesse had been to visit before, and we had climbed both of those times in Rocky Mountain National Park and also on the first Flatiron in Boulder. This trip, we decided to do three days of climbing in three different places, all within an hour of Denver: Boulder Canyon, Eldorado Canyon, and North Table Mountain. I have a special love for Boulder Canyon because it is where I first started honing my skills as an outdoor rock climber. There are around 1,500 routes from which to choose for climbers of all ability levels, and there are plenty of both sport routes (bolts and hangers are already drilled into the rock walls) and traditional (“trad”) routes (with no gear pre-attached to the walls) to suit every climber’s style. Though on the weekends Boulder Canyon can get somewhat crowded with climbers, since it was a weekday we had the part of the canyon at which we were climbing, the Bihedral, almost entirely to ourselves. A second pair of climbers arrived, of course, just at the moment I thought it would be fun to do a big Tarzan-like swing across the rock face, howling included. After a bit more climbing, w came back to Denver for a dinner at Vine St. Pub, which never disappoints. The next day we had more time to spend on the rock, so we went to Eldorado Canyon where we did multi-pitch trad climbing. Multi-pitch climbing enables you to get hundreds and even thousands of feet off the ground, as after each pitch of climbing, instead of going down to the ground, you continue to go up. 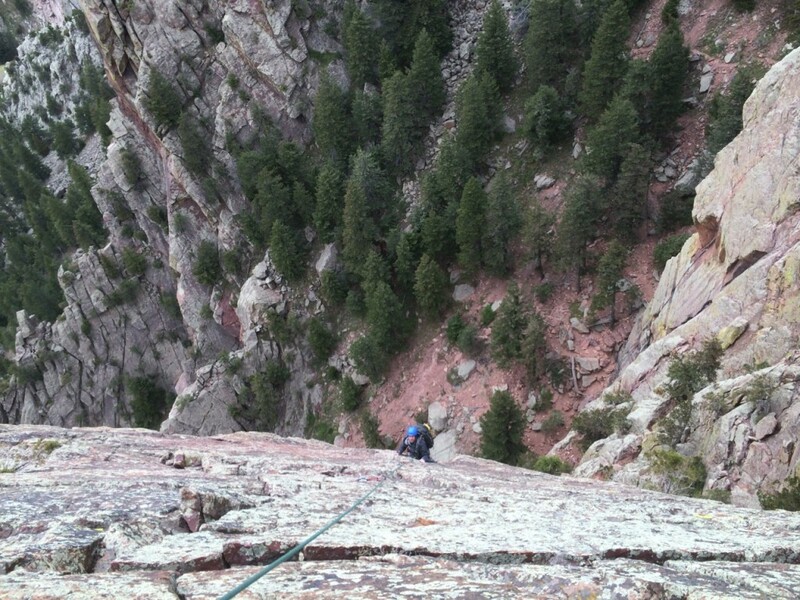 Eldo, as is it is called by climbers, is a fantastic place for this style of climbing. The walls are big, the climbing exposed and invigorating, and there are over 1,000 routes from which to choose. We climbed the classic Icarus route, which though it is rated relatively easy from a climbing difficulty perspective, is thought to be one of the best routes at its grade in all of Boulder (and still can get the adrenaline flowing–Eldo routes are stiff for their grades). The route was awesome–with some great chimneys, cracks, and slabs–and it finishes on a breathtaking and super exposed arete (check out this photo to get a sense of the exposure) atop which climbers are rewarded with tremendous panoramic views. The descent on this was also great; after a short hike down you do three beautiful and airy 90-100 foot rappels. So much fun. 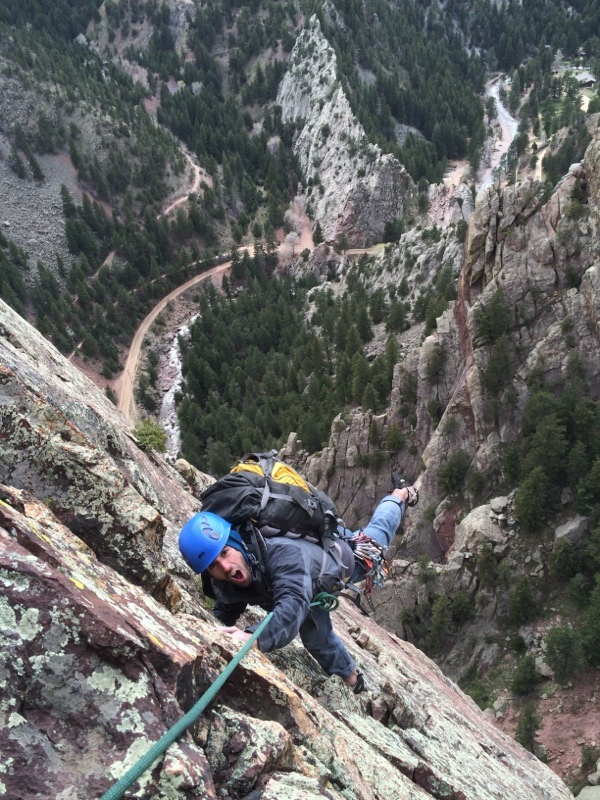 Eldo is a fantastic place near Denver/Boulder to do multi-pitch trad climing. Our last day of climbing was at North Table Mountain, just north of the Coors Brewery in Golden. I love North Table Mountain because it is so close to Denver–a mere 25 minute drive gets you to the base of a 10 minute hike; so you can go from couch to climbing in just 35 minutes. The proximity to Denver was the main reason we chose to climb there that day, because I had a real estate closing in the morning and we had a dinner with friends at Los Chingones scheduled for early that evening. North Table Mountain is a ridge of rock ranging from about 60-90 feet tall which surrounds a table-like plateau (hence the name). There, again, we largely had the place to ourselves since it was a weekday, and we were able to do a good mix of sport and trad climbing. Since the routes are short and all next to each other (a climber’s trail travels the length of the base of the ridge), you can quickly move from one route to the next. And, since the rock is predominantly south and west facing, it is a great place to climb even on a cold or wintry day. I had such a Good time climbing with Jesse, and it reminded me just how lucky we are, in Colorado, to be home to some of the best rock climbing in the world. There are almost 10,000 established outdoor routes within 60 miles of Boulder and Denver, and there are lots of Good books that can help get you started. Online, Mountain Project is a phenomenal resource with route descriptions, updates, photos, and commentary. But if you’re just getting into rock climbing, be sure to go out with an experienced friend or guide. Rock climbing can be dangerous. Interested in buying a home in Denver? Click here so that I can help you get the process started.